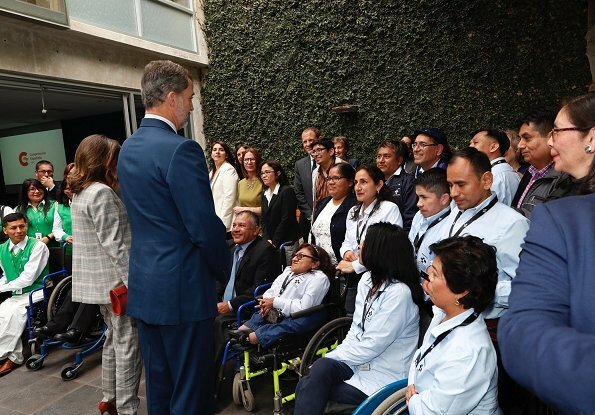 On the second day of their state visit to Republic of Peru, King Felipe VI and Queen Letizia of Spain visited the Technical Office of Cooperation of the Embassy of Spain on November 13, 2018 in Lima. 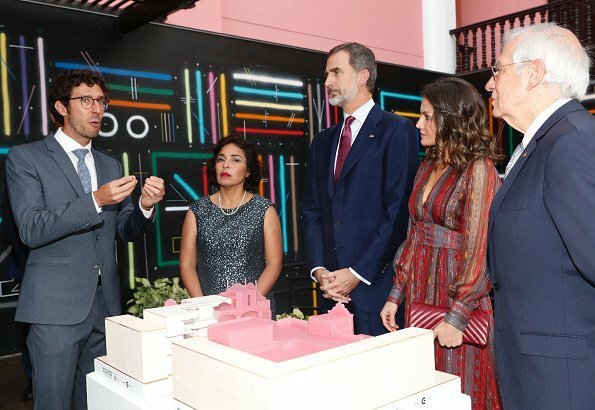 Then, the King and the Queen visited Cultural Centre of Spain in Lima, which will present 2019 edition of International Contemporary Art Fair (ARCO), and there, the King and the Queen toured The Migratory States exhibition. 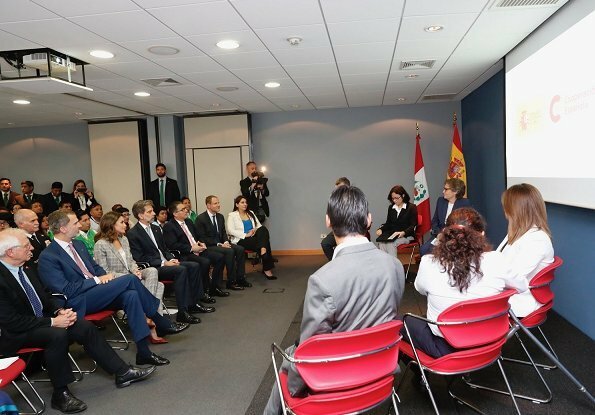 At the last hour of the day, the King and the Queen will attend a reception held for the Spanish community at Spanish Embassy Residence in Lima. 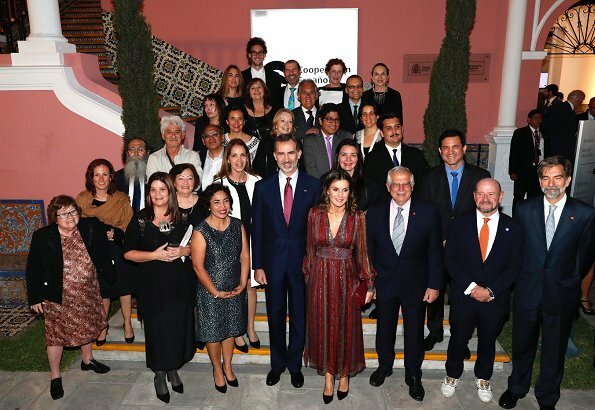 King Felipe and Queen Letizia visited Cultural Centre of Spain in Lima, which will present 2019 edition of International Contemporary Art Fair (ARCO), and there, the King and the Queen toured The Migratory States exhibition. 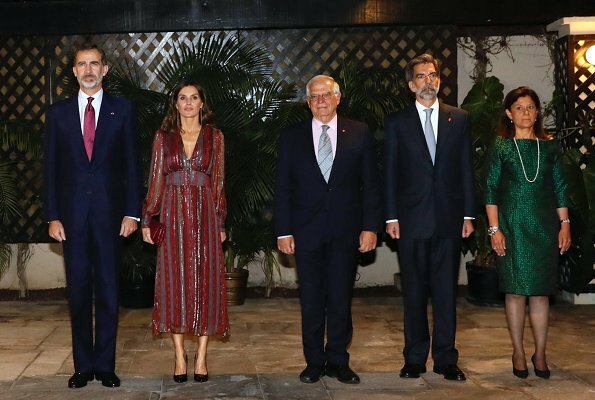 Then, the King and the Queen attended a reception held for the Spanish community at Spanish Embassy Residence in Lima. Usually like Letizia's fashion choices, but this pantsuit is just too much check for me. Would have liked the jacket with a black top and pants. Miami Vice? Just roll up your sleeves and you´re good to go. Nice suit today. Shoes and bag are a nice contrast. A nice change to her usual wardrobe choices. Love the bag and shoes. Not a fan of the suit though Anon 10 28's suggestion of black trousers instead of the check ones, or even black jacket with check trousers might have been an improvement. Totally disappointed by both outfits. Surprisingly poor choices for both occasions. It seems like she is drawing inspiration from Melania Trump. She looks great. Going out on a limb here and assuming that neither lady is in anyway influenced by the other. Love Letizia's hair when wearing the dress, so pretty curled. The colors of the dress are rich and beautiful, just wish it were not so long. Wow! Letizia looks great! The only thing would change would be to take up the pants a little to eliminate the slight puddling. She has nailed both outfits. And extra points for her hair and feminine leg cross (pic. 10). I very much like her second look - I like the dress and hair. Not keen on the suit - nothing wrong with it in itself but it's quite wrinkled which makes the material seem a bit cheap. 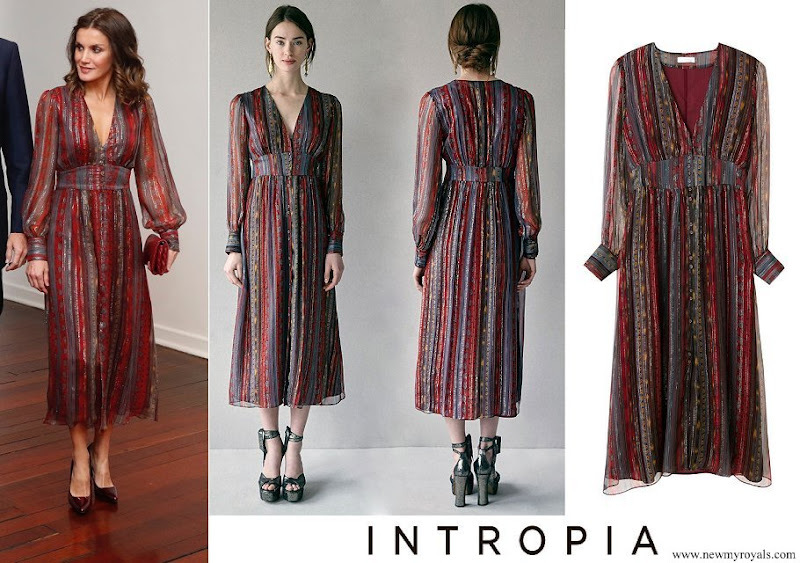 The dress is stunning and a Spanish brand "Intropia", I am going to buy it for myself. The suit is what we wear to work everyday. Confortable. The rich colors of this dress and the silver streaks are another nod to Peru. The shoes elevate the outfit. It's not my favorite pantsuit but I like the contrast with bag and shoes. The dress it's very nice but better is when her dress mach with King tie, I love that detail. Hermoso vestido con colores que hacen pensar a Peru, muy bien pensado. Bravo reina Letizia! El traje pantalón me gusta, muy working girl. 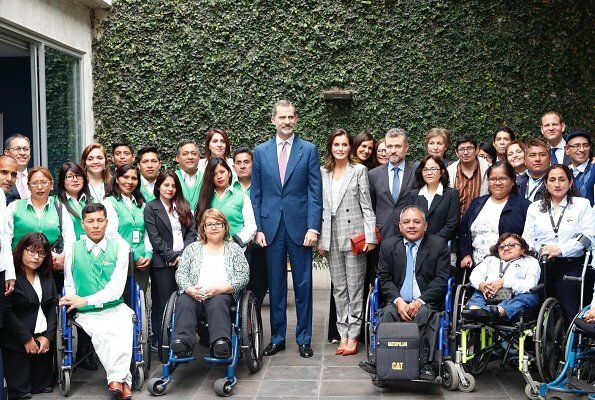 La chaqueta parece grande, aunque puede que se deba a que es cruzada. Zapatos y bolso estupendos. El vestido multicolor de Intropía es MARAVILLOSO. Si lo encuentro, será mi vestido del día de Navidad :). 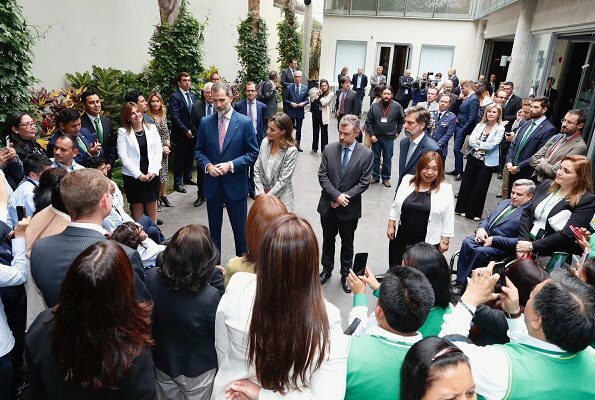 Letizia está bellísima con el cabello ondulado. Yo veo que va muy adecuada y se nota que se esfuerza por lucir bien en cada una de sus presentaciones. Un feliz viaje reina Letizia !